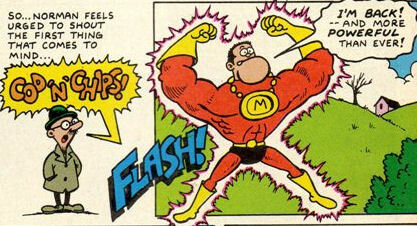 Powers/Abilities: Superhuman strength on a par with the Hulk (lifting in excess of 100 tons - or "the strength of a million gorillas"), "macho-vision" (telescopic vision), able to fly, invulnerable, and very clumsy. 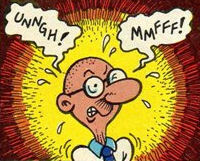 His human host, Norman Dribble, possesses no powers other than the ability to swap places with Milton Zook, a.k.a. Macho-Man, upon saying his magic words; they automatically switch back after a short time, which can be inconvenient for Norman is Macho-Man was in the middle of doing something dangerous. History: When the planet Klakton unexpectedly exploded, fragments were sent hurtling across space. One of them, carrying a Klaktonian called Milton Zook crash-landed on Earth. Choking, Milton realised his new world's atmosphere was poisonous to him, and that he would have to merge with a human to survive. Spotting unemployed earwax salesman strolling nearby, Milton decided he would have to do, transformed into energy, and entered Norman's mind. He then probed Norman's brain to find a password that would allow him to trade places with his host, prompting Norman to shout the first thing that came into his mind: "Cod'n'chips." Norman vanished to be replaced by Milton, who discovered that due to Earth's different gravitional pull and his alien molecular structure, he now had superpowers. Figuring he was now tremendously macho, he dubbed himself Macho-Man. 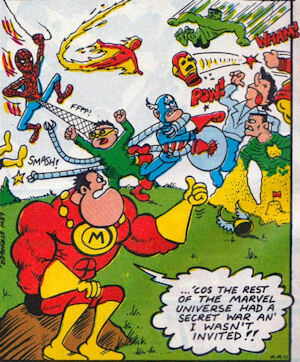 At one point he was captured and imprisoned alongside other minor heroes, until Combat Colin freed them all. He later tried to assist Colin against Dr. Doom's robotic Steamroller Man, but was literally flattened by the machine. He recovered from that dismal defeat, but when he subsequently tried to help Colin battle Megabrain's alien army, he was blasted into atoms. Comments: Created by Lew Stringer. After debuting in Captain Wally's strip in The Spider-Man Comic, Macho-Man graduated to his own strip in Secret Wars, where he appeared in #42, 44, 51, 52, 53, 58, 63, 67, 69, 75 and 79. He reappeared as a guest star in Combat Colin's strip in Transformers #245, again in #270 and 271, and finally in #296, where he met his fate. 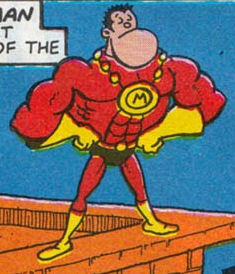 Lew Stringer has stated that as far as he is concerned, the Macho Man who debuted in Captain Wally's strip is a different Macho Man, though part of the same "Lewniverse." 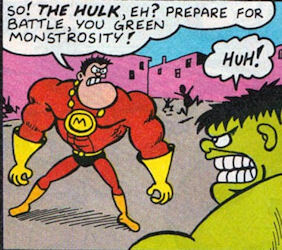 That more belligerent Macho Man, self-proclaimed "Master of Power," is a villain who picked a fight with Captain Wally.